Ian Davis was born in the Melbourne suburb of Brighton in 1953. He has one brother Raymond, a retired industrial Chemist. In 1958 his father Charles, a bookseller, and his mother Marjorie purchased a news agency in Yarrawonga where the extended family, including grandfather Leslie Pearmain (a retired accountant), moved. Ian began primary school at Yarrawonga State School in 1959. The family moved back to Melbourne in late 1964 and Ian completed his primary and secondary education in Melbourne. He was in the first group of students to complete the Victoria Institute of Colleges’ Bachelor of Engineering (Electrical) degree conducted by Caulfield Institute of Technology (CIT) in 1975 (degree conferred early 1976). After completing his Bachelor degree Ian was invited by CIT to undertake a two-year research programme in Doppler radar for a Master of Engineering degree. The research programme was completed in December 1977, the thesis submitted in December 1978 and degree awarded in 1980. 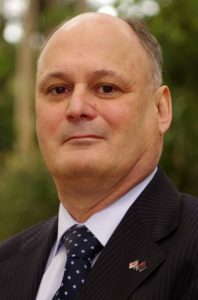 From February 1978 to May 1979 he worked as a tutor demonstrator at the Royal Melbourne Institute of Technology’s Department of Communications and Electronic Engineering. In May 1979 he joined Decca Radar’s Research and Development Laboratories in Walton-on-Thames Surrey, England where he gained experience in antenna systems. The Development of the next generation European Space Agencies ground station antennas for deep space and near earth applications. Multiband Satellite Antennas- Ian was the project leader for the development of a new dual band X and Ka-band satellite antenna feed system. This was some of the early work in high performance dual band antenna feed systems for satellite ground station applications. Dual band feeds are needed in applications where there is little space for multiple antennas. Since this work was done there has been a growing demand for dual band antennas for maritime satellite communications applications as well as normal land-based satellite ground stations. Feed System for Radio Astronomy – Ian was involved in the development of a new feed system for radio astronomy applications for use on the Parkes Radio Telescope, the Australia Telescope Compact Array and India’s Giant Metrewave Radio Telescope (GMRT). Millimetre Wave Technology – In 2006 Ian took charge of the ICT Centre’s mm-wave technology research programme which included the mm-wave MultiGiga bit link which Ian saw through to a successful completion, a CSIRO Chairman’s Medal and an Engineers Australia Engineering Excellence award. Ian joined a newly established satellite communications antenna team at BAE Systems in 2008. Feed systems to support the special requirements of CSIRO Astronomy and Space Sciences. Ian Davis is a senior member of the Institute of Electrical and Electronic Engineers and a member of the Institution of Engineering and Technology.